ColecoVision.dk Homebrew Section Presents: Florent Bedoiseau. On the ColecoVision scene started Florent with a single ROM board. This board could store one ColecoVision game. Florent is also working on things to Atari 2600, PSP, NDS, Linux, Unix and others. Florent working right now on a project to put 31 ColecoVision games in 1 cartridge. We succeed to release the first prototype version. Florent is working on the hardware part, and Ludovic worked on the software/loader part. 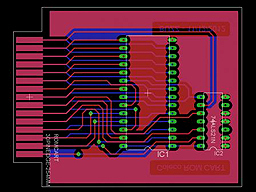 Florent made another one with SMD components, to reduce the PCB size. Another version is in progress : 63 ColecoVision games on a single board, with SMD components. This PCB shows the first single ROM. Second one is for 31 ROMs. The 3rd can store up to 63 games. Florent do also have an idea of making his own ColecoVision. 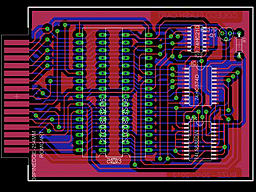 The schematics are not finished and are still in progress. The original schematics from Daniel Boris contains errors and use very old components. For the moment most of the important pieces are ready to route : Clocks, CPU, GPU and IO. Florent do not know yet if he will route these on a single board or if he make it as different pieces. 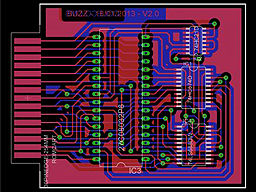 Florent will let us know when the schematics are available and when the PCB are ready. Another thing Florent now working on is something different. Florent and his friend Ludovic would like to make a save-restore state board. This board will be used to save the RAM somewhere and allow the gamer to restore the coleco memory at any moment. To get in touch with Florent, try this: e-mail.